Jerky is a great snack to have on hand. It’s also perfect for backpacking, hunting, kayaking and camping trips. Making your own jerky is simple and cost-effective. Jerky can be dehydrated or smoked, depending on your preference and can be completed in a day with very little hands-on time. I encourage you to give it a try and let me know how you do!! Here are 5 simple steps to get you started. We’re lucky to have meat readily available in our freezer from our beef. Occasionally we’ll have venison or other game to pick from as well. We prefer to use our least favorable cuts or select the oldest meat in the freezer. If you don’t have access to a ready supply, watch for sales. You can use a tougher, drier cut for jerky, so these are generally less expensive to start with. 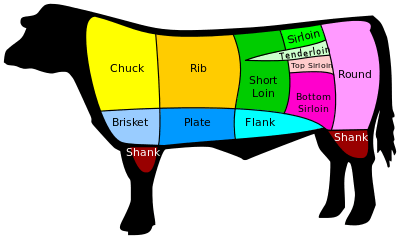 Tougher beef cuts generally exist towards the outer extremities of the animal. These are the parts of the animal that do most of the work and are the most muscled. More muscle equals less fat (marbling). Rump roasts and round steaks work well for jerky as they have a low fat content. Chuck roasts can be used as well, but these are my favorite roasts as they tend to have more marbling (fat) and flavor. As you move toward the center of the animal, particularly, the upper back, the cuts become more tender. These areas of the animal do not get as much work. Thus the loin, short loin, and rib area are best saved for steaks, such as ribeye, sirloin, t-bone, etc. Remove all fat from the cut of meat you are using before slicing or grinding the meat. Fat can affect the flavor and quality of the end product. After this is complete, you can slice the meat or grind it. We prefer to grind our meat. We use an electric meat grinder . This electric grinder is probably 30 years old or more. It’s helped us process many animals over the years. Definitely a great investment! Grinding the meat breaks down the collagen and produces a nice, flavorful product without being stringy and hard to chew. If you don’t have a grinder or prefer using sliced beef, place your roast in the freezer and leave until firm but not solid. This will help the meat be more stable for cutting and will make your knife easier to control. Slice the roasts no more than 1/8th inch thick and slice against the grain rather than with it. Certainly cutting the roast with the grain is an option if you enjoy a chewier end product. My husband is working on a batch this week and is using a mix. Here is a link to the Backwoods brand. He’s used it in the past with success. It has a nice flavor and includes a cure as well. Ground beef is mixed with marinade and prepared to rest in the refrigerator overnight. Mixes are a great way to get started as they provide easy to follow instructions for the entire process. You’ll gain confidence in your skills and be ready to kick it up a notch and try your own mixes when you’re ready. There are many seasoning recipes for jerky and are very similar to marinades. Most typically include soy sauce, salt, Worcestershire and options such as honey, brown sugar, maple syrup, ginger, garlic, onion, etc. It’s important to note that studies have been done on the safety of jerky and the greatest concern in making it is the potential for e.coli or Salmonella. The United States Department of Agriculture (USDA) recommends heating your beef jerky to an internal temperature of 160 degrees for 10 minutes to kill the bacteria. Fowl should be heated to 165 degrees. Once that temperature is reached, you can proceed with dehydrating your jerky. The use of cures was studied, and it was determined that meats with cure had fewer pathogens than marinating alone. However, the best results were from pre-heating your meat before dehydration. Cures work to lengthen the preservation period of meats. There is some pathogen resistance obtained with the proper amount of cure. Remember that even cured meats should be refrigerated. Here is an article with additional information about curing from the National Center for Home Food Preservation. We use a Jerky Gun which makes the process really easy. Simply fill the gun with the ground beef mixture and squeeze it out like a caulk gun. There are several attachments so you can choose the shape you prefer. Jerky guns come in many sizes. The final step in the process is to preserve the meat. The two main options are dehydrating and smoking. We use our dehydrator for this process. Best practice is to dehydrate at a temperature of 130-140° F (54-60° C). This will ensure that bacteria do not grow (after initially heating to 160) and assist in removing enough liquid from the product. This can also be done using an oven. The reason we switched from the oven to the dehydrator is that the dehydrator is designed to move air around the product with its built-in fan, it is easier to dehydrate more product due to the design (more racks in a smaller space), and it’s less messy than doing it in the oven. Most dehydrators have a flat, smooth surface under the racks, so any drops of marinade or meat are easily cleaned up. The first layer is ready to go. This dehydrator has 4 more racks that will be filled before it gets started. The other option is smoking. Smoking can add great flavor to the jerky. Smoke on low heat, 130-140° F (54-60° C), for 6-8 hours until the meat appears dry. The finished product! Can you smell the maple scent? Mmmmmmmm! Check out these books for additional information. Great post!! I’ve done jerky before and failed miserably. I think I cut it to thick as it was just strips. This is definitely something I would attempt again. Funny you gave a link for Hirsch’s. That is my butcher LOL! Are you local or just gave credit? Thanks! Thanks! You should absolutely give it a try again! It’s so tasty! What are the odds regarding Hirsch’s – that’s so random! I actually wanted to give credit for the image – I’m not local but love that you go there! !